This is a 'pocket Bible', typical of the 13th century. They were produced in huge numbers especially in Paris, but also in England, and in Italy, where this one was illuminated. In the 12th century Bibles were typically written as sets of large volumes, but in the early 13th century the text and the order of the books was standardised, and a very small-scale format was established. It has been persuasively argued that one of the reasons for this development was the existence of the mendicant orders, which needed small, portable books. This manuscript has ownership inscriptions of the Franciscan convent at Walsingham, between Fakenham and Wells-next-the-Sea, in Norfolk. In the left-hand column is a prologue to Matthew, and in the right-hand column the start of St. Matthew's Gospel itself. 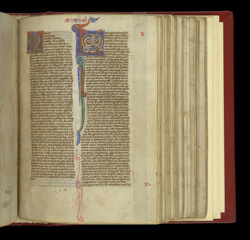 The triangular gap at the top right-hand side of the left column was left by the scribe for a rubric to be inserted later, but this was never done.